In early 1860, King Kamehameha IV decreed that a Royal Cemetery be established in Lower Nuuanu valley. Legend suggests that the selected site, Mauna Ala, was also the location earlier chosen as the battleground when King Kamehameha I invaded Oahu. Construction of a Royal Mausoleum for the interment of Kings and Chiefs at Mauna Ala was begun in 1863 and portions of the mausoleum were completed in 1865 when the first interment took place. In 1948, our present cemetery property, located directly below the Royal Mausoleum, was acquired from the Robinson Estate and the Cemetery was incorporated July 11, 1949. 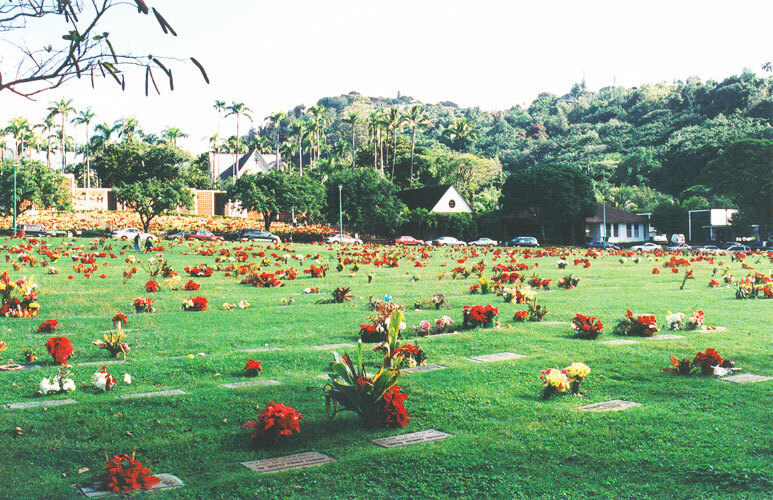 Unlike many of the traditional cemeteries, Nuuanu's concept was that of a tranquil garden-like memorial park. The open space and large monkeypod trees along Nuuanu Stream compliments the character of the adjoining preservation district and Nuuanu Stream Parkway System. Most important of all, Nuuanu Memorial Park's perpetual care program provides absolute assurance that the Memorial Park will forever remain open space. Three important petroglyph sites are located about 50 feet south of the Alapaena Pool, which is located at the base of a sloping hill at the edge of the Park. The sites are considered part of the preservation district and are protected under its jurisdiction. Identification of the sites can be found in "Hawaiian Petroglyph," a book by J. Halley Cox and Edward Stasack. For the convenience of servicing families for funeral services, Chapel of the Flowers was dedicated for service on August 27, 1950. A second chapel, East Chapel, was completed in October 1959. Over the years, Nuuanu Memorial Park has served families of many different religious and ethnic backgrounds. It strives to best serve the public through the honor and respect of individual customs and beliefs.